AI and robots are displacing science and tech workers. The question is: How quickly? Editor’s note: David Deming is a professor of public policy, education and economics at the Harvard Kennedy School. This analysis is being published here in collaboration with EconoFact, a nonpartisan economic publication. Automation has displaced workers in many occupations, from manufacturing to routine office jobs. New research finds that employment growth in high-paying jobs has slowed since the year 2000, and that this has been particularly true for jobs in science, technology, engineering and mathematics (STEM). One possible explanation is that rapid advances in artificial intelligence and robotics are making it possible for a wider range of technically demanding jobs to get automated. While there is much current attention on technology displacing workers in the near future, this type of disruption is not new. There is a long history of technology altering the way things are produced and having significant impacts on employment. In 1900, for instance, 41 percent of the U.S. labor force was employed in agriculture. Thanks to the development of a broad range of agricultural technologies, by 2000 only 2 percent of the U.S. labor force worked in agriculture (see this study for a review). Automation has become increasingly common in U.S. manufacturing. The U.S. lost more than 5 million jobs in manufacturing since the year 2000 despite steady output growth, a sign that robots are replacing human labor. What is relatively new is that, since 2000, there appears to be a slowdown in higher-paying, skilled jobs and that technological change could be playing a role in this shift. After two decades of expansion, growth in the share of workers employed in high-skill “cognitive” occupations (those classified as managerial, professional, and technical categories by the U.S. Census) slowed down. In my research, I find that the changing trend is driven by a decline in the share of jobs in science, technology, engineering and mathematics — the so-called STEM fields — which shrank by a total of 0.12 percentage points as a share of the U.S. labor force between 2000 and 2012, after growing by 1.33 percentage points over the previous two decades. 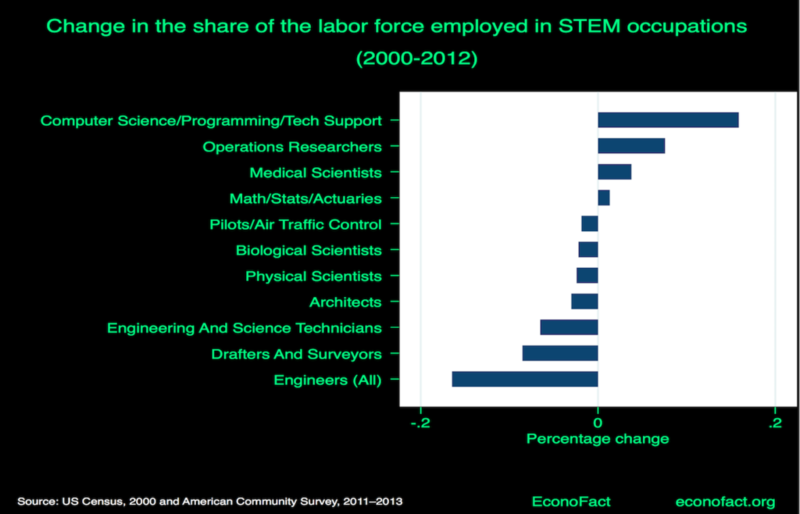 While the share of workers employed in some STEM occupations such as computer science and programing rose, it declined in many others such as engineering, architects, and physical scientists (see chart). In contrast to STEM occupations, all other “cognitive” occupations grew by 2.87 percentage points between 2000 and 2012. The fastest growing “cognitive” occupations — teachers, managers, nurses and health technicians and therapists — all require significant interpersonal interaction. Jobs requiring social skills have experienced strong relative employment and wage growth. Between 1980 and 2012, jobs requiring high levels of social interaction grew by nearly 12 percentage points as a share of the U.S. labor force. The greatest relative growth was experienced by jobs that require both high math and high social skills, which grew by 7.2 percentage points as a share of the U.S. labor force. In contrast, jobs that require high math but low social skills shrank by about 3.3 percentage points over the same period. During the 1980-2012 period, wages for jobs requiring both high math and high social skills grew by 26 percent while those that required only high math skills grew only by about 5.9 percent. Over the last three decades, jobs that combine both social and math-intensive skills have seen strong wage growth. They have also grown as a share of all U.S. jobs. In contrast, many STEM occupations that require high math skill but very little social skills have fared poorly. 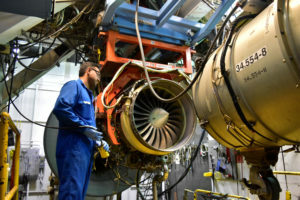 There is growing demand for workers who are flexible and adaptable and who are skilled at working in team-based settings. All of these skills are still difficult to automate. David Deming is a professor of public policy, eduction and economics at the Harvard Kennedy School.